Always Ready When You Need It Don’t leave your family in the dark. Be ready for even extended power failures with LIGHTS OUT, a long lasting, rechargeable, LED safety light. Simply plug it in to any standard electrical outlet with the removable 6' AC adapter, choose your settings, and you’ll be ready when the lights go out. Long lasting We combined a powerful, rechargeable 6 volt battery with high intensity and energy-saving LEDs. The result is an emergency back-up light that lasts up to 20 hours using both lamps, and up to 40 hours when set to a single lamp. The battery can be recharged over and over and the LED bulbs will last for years. The “on-off” switch lets you turn off the lights when not needed, to conserve battery lifeduring a power failure. Many similar-looking models cannot be turned off, beware of imitations! Portable and versatile A photocell-controlled night light feature can provide soft lighting at night or in a dark area. Place the unit on a shelf or mount it on the wall in areas where safety lighting may be required. The removable 6' AC adapter and the built-in handle make the LIGHTS OUT a great alternative to a flashlight for use as a hands-free work light in your shop, under the sink, or when doing auto repairs. Maintenance Keep it plugged in with the 6' UL-approved adapter and the light will always be ready when you need it. The battery will last for many years if properly cared for, and is replaceable. We recommend using the TEST button on a monthly basis to ensure that the battery charge is holding. If left unplugged for extended periods, even in the off position, the battery will slowly drain. Unplugged, the battery will hold power for 3 months. If left unplugged, the battery should be recharged every 3 months for 72 hours. The LIGHTS OUT is for indoor installation use only. LIGHTS OUT is backed by a one-year limited warranty. Water damage is the most common cause of insurance claim in North America, and can often cost tens of thousands of dollars to repair. This easy-to-use water detector can give you peace of mind by alerting you to leaks, even when you’re not home! Avoid or minimize damage from faulty appliances, burst pipes, sewer backups, leaky roofs, heavy rainfall, overland flooding, and more.When the sensor makes contact with water, a loud 105dB alarm is triggered. If paired with one of our telephone dialer systems (SK633, SK642, SK662) the control panel immediately starts dialing. The panel can be programmed to redial up to 5 times, with multiple phone numbers. The local alarm will turn off after 45 seconds. 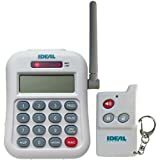 It is also compatible with our starter kits (SK618 and SK698) and our wireless alarms (SK623, SK626 & SK635).Installation is easy: Simply install a 9-volt battery (included), place the sensor on the floor, set the switch to alarm and/or pair it with a dialer. With the long 6-foot sensor wire, you can keep the alarm unit easily accessible while placing the sensor in hard-to-reach but vulnerable locations such as a sump pump pit. The built-in suction cup on the sensor lets you stick it to the inside lip of a bathtub or sink, for warning alerts before an overflow. Use it wherever leaks might occur: Near hot water tanks, dishwashers, washing machines, sinks and drains. It’s especially useful where they are hard to detect, like slow drips behind appliances or under a hidden drain pipe.The SK616 has a low battery warning. 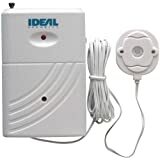 IDEAL Security has been supplying quality products since 1956. Please contact us for any installation problems at info@idealinc.com. SK618 Features: -Alarm by zones, includes 24 hour zone. -Can link up to 23 sensors and eight remote controls to this dialer. -Stores up to five emergency phone numbers. -Call in to activate and deactivate alarm. -Monitor activity by phone following alarm signal. -105dB Integrated siren (external siren can be added). 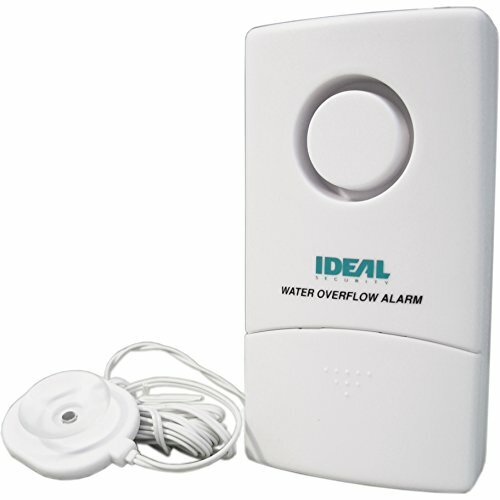 Product Type: -Motion Sensor Alarm. Connection: -Wireless. Number of Items Included: -2. Dimensions: Overall Height - Top to Bottom: -2.68". Overall Width - Side to Side: -1.46". Overall Depth - Front to Back: -0.28". Overall Product Weight: -1.25 lbs.